SAYT progressively searches for and filters through text. As a user types a query, suggestions, products, categories, and attributes are found and presented with each keystroke. This allows a user to stop short of typing the entire word or phrase and find what they were looking for quicker. 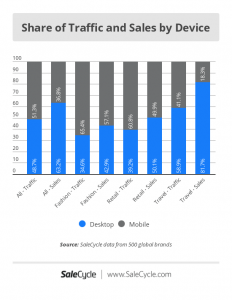 Most search software will show search suggestions, and many now display products. But does your search provider include price grouping or category and attribute options as part of their SAYT? 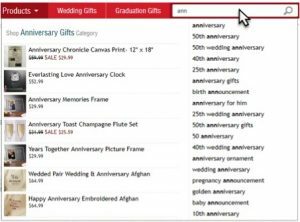 The user is looking for an anniversary gift and the letters “ann” have been typed into the search. The above drop-down panel is displayed without needing to execute the search. Alongside the search suggestions in the right-hand column, a popular category to browse, and 7 products are displayed, based on the first search prediction, “anniversary”. Scrolling through the search suggestions using the down and up arrows updates the real-time search and therefore the categories and products displayed. Personalization Mall could have also configured their search so that it updates just by a mouse hover for a certain amount of time. Typed characters are shown in bold in the list of suggestions, with the rest of the suggestion in normal type. It is good practice to highlight matching characters to the user in this way. Often, auto-complete systems only show suggestions that begin with the typed characters, but we can see here that the suggestions can contain “ann” anywhere. Presenting customers with the most relevant search, product and category suggestions is essential. Consequently, getting the right products in front of the customer as quickly as possible shortens the path to conversion. A novel approach to SAYT is personalized SAYT. It is possible to use a customer’s search history for that site to find suggestions for the first few characters typed, then for subsequent characters to display suggestions based on the most popular searches overall. Another EasyAsk customer, Timberland, opted to configure their site search in this way. Timberland stored each of their customer’s searches in a cookie on their browser, so that when a customer started typing a search, they would see suggestions based on their personal most popular searches. After two or three characters had been typed, Timberland’s site would call EasyAsk to retrieve the most popular searches for all customers. This is just one example of the flexibility and variety that EasyAsk can deliver in terms of customization. Another useful feature is the ability to pre-populate the suggestions file with part numbers, so that when the user starts to type in a part number, the remainder will be auto-filled. Consumer expectations are changing. How often do they actually expect to finish typing a search? Increasing numbers of users are programmed to look for autocomplete, so businesses should understand how important, yet simple, SAYT can be.